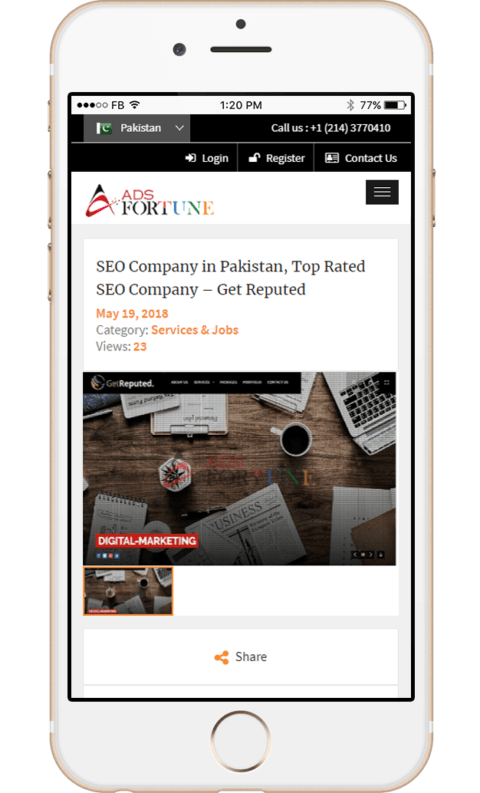 Ads Fortune makes it easy and simple yet effective for individuals and businesses worldwide to post free ads from any part of the world, be it Australia, US, UK or Canada. Expand Your Business with Unlimited Free Ads! Ads Fortune gives the freedom to seller and buyer to sell and buy freely without paying any commission or having a middleman. Being seller, you can now post unlimited ads and sell free, while being buyer, you can access to as many sellers as you want. With featured ads posting facility, you can now make your ads stand in the crowd. Just pay as low as $5 and get 3 featured ads in addition to unlimited free ads. To ensure non-stop service availability, we offer 24/7 customer, sales and technical support to our sellers. In this way, sellers can reach us via any means including live chat, phone call, email or social media messengers. Our classified and ads posting website allows sellers and buyers both to post and view ads in their respective region only. They can also sort or post their ads in a specific region such as US, UK, Canada, UAE, Australia, Pakistan & India. We have packages for individuals and businesses. We charge as low as $5 for individuals and $10 for business for unlimited free ads post and up to 8 featured ads. We also have premium package for marketers or large businesses. Post and list your ads via easy and simple steps for free of cost. We provide ads posting facility in different regions of the world including US, UK, Canada, UAE, Australia, India & Pakistan. Sellers can post their ads in any currency from the multiple currencies options such as dollar, pound, and rupees. With track history feature, you can track the status of ads and monitor when they expire or visible on the website. Through user dashboard, you can manage your seller profile, manage ads, select package, and view and reply messages. We ensure that you get more value from your ads. So, we offer featured listing option and charge you a reason amount. For sellers, we offer a facility to sign up for free and charge 0% commission on any sale. Thus, our service is absolutely free! Automation is the key to success for a small and medium size. Automation speeds up the process by reducing the manual work. We use technology to enable your business activities automatic. Activities such as HR, Accounts, Customer Relationship Management and Project Management System are a few examples of business automation. You can now post your ads in any category of your choice because we offer multiple categories options. 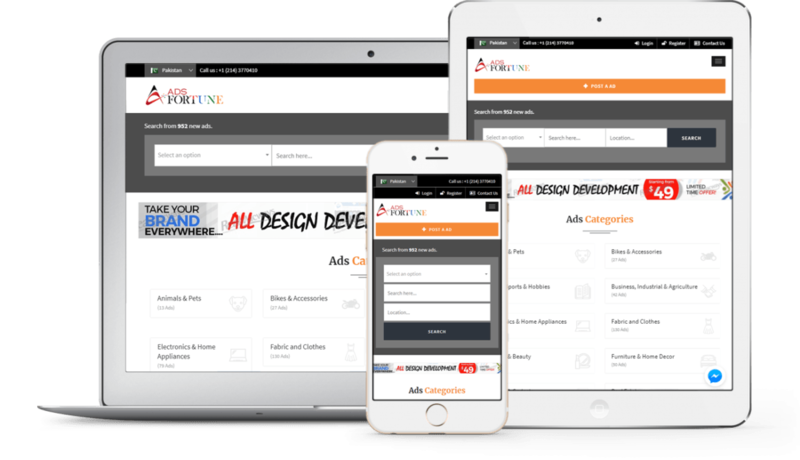 Ads Fortune is built on responsive structure and can be used on any device. Simple & Unique User Interface! 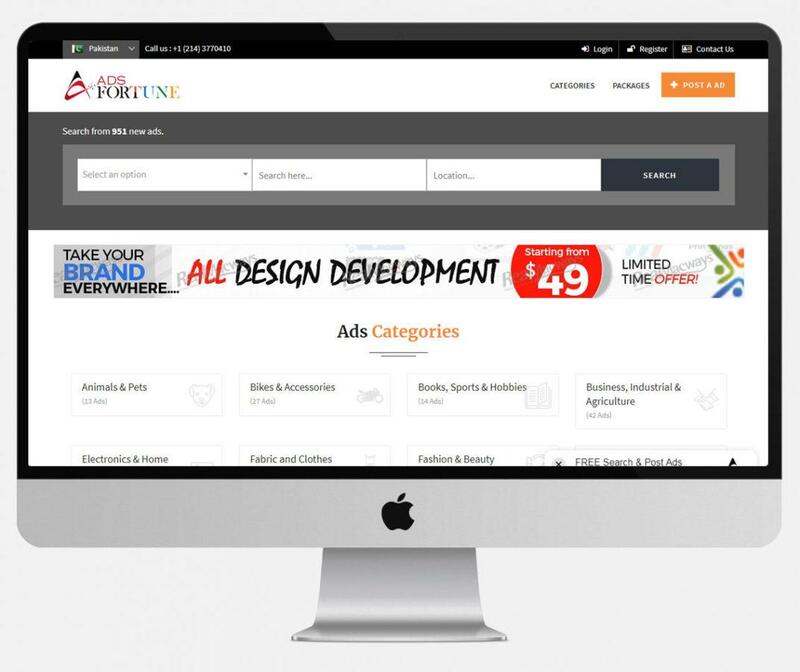 Beauty is in simplicity of our Ads Fortune website design. With white background and easy and simple search and post features enhances the visibility of the website for both buyers and sellers.